Finding healthy food when you’re at a festival show can be a challenge. 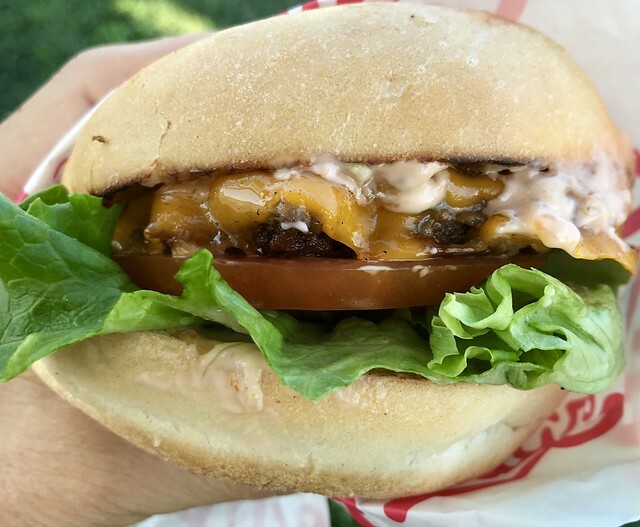 For those health-conscious eaters, there’s Monty’s Good Burger, which has popped up at both Coachella and the recent Arroyo Seco Weekend. Frustrated by the lack of healthy dining options in Riverside, Monty’s Good Burger was formed, using 100% plant based meat and locally sourced produce. Being neither vegan nor particularly health-conscious, I happened to visit Monty’s Good Burger because there was a short line in the shade during the Pretenders’ set during Arroyo Seco. The menu was pretty simple – burger, fries or tater tots, sparkling lemonade, kale salad and cookies. Monty’s uses the Impossible burger patty, made entirely plants, so it’s vastly more environmentally friendly and easier on your arteries. They even use a vegan cheese, which melts exactly like its dairy counterpart. From appearances, it looks like a regular meat-based burger, with lettuce, tomato, grilled onions, pickles and a house spread (which was basically 1000 Island dressing). It even tasted like a real burger. I did, from time to time, encounter a funny aftertaste that I couldn’t figure out the source of. Sampling each ingredient, I did not find the culprit. If anyone has any ideas as to what it might have been, please let me know. Even though I’m a tater tot fanatic, we ordered fries. I’m glad we did. Their skinny fries were exceptionally good, crisp with just the right amount of salt. These were the fries that I wish In-N-Out served. 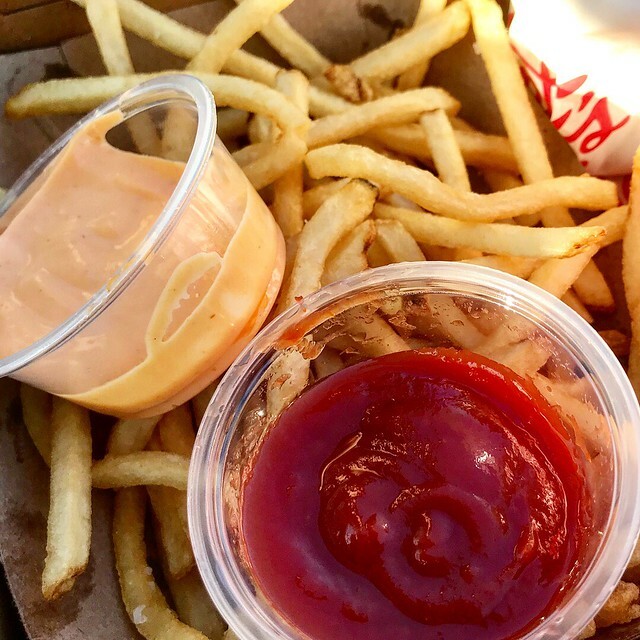 You got to choose a couple of dipping sauces – we went old school with their house ketchup and a sriracha aioli, which had just the faintest bit of heat. The sparkling lemonade, which cost a whopping $8 (damn festival shows), turned out to be freshly squeezed lemon juice over Canada Dry soda. It was surprisingly refreshing, especially since it wasn’t too sweet, perfect for quenching one’s thirst on a hot afternoon. Prices are much higher than your typical fast food, so it will be interesting to see if Riverside residents are willing to pay 3-4 times more for an Impossible Burger. Hopefully Monty’s Good Burger will find success once it opens, giving Riverside a healthy dining alternative.